With August 2018 it has been 228 years since the first U. S. Census was taken in August 1790. Doing any type of family history research you are very dependent on using any census. If your ancestors date back before 1790 that is many censuses to cover to bring your family to mid-20th century. But why that first census? As written in the U. S. Constitution, a method was needed to know how many people lived a specific district for the right number of Congressmen could represent that district – so a census was needed. Also how many males of military age would be available if the need arose for this young new nation in 1790. The official date was August 2, 1790, the listing made for how many males and females of a certain age were in a household. Every household was to be visited and the number counted. True, that task by a census taker took awhile, not done solely in one day, just selected that day as a point of reference. The final total population of the United States was enumerated to be 3,929,214. That would make a neat entry for your family history of any ancestors living in the U. S. as of August 2, 1790, even those born August 1st. 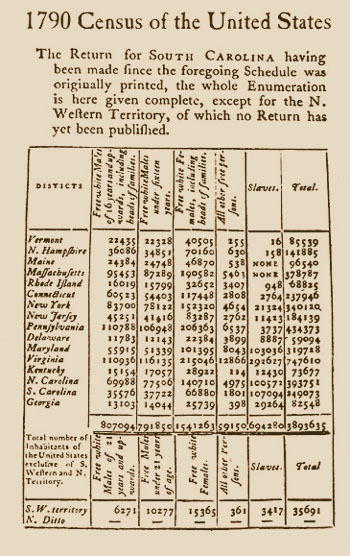 In 1790 the state of Virginia had the greatest population of 747,610 and Delaware the least number with 59,094. The top two cities in population were NYC with about 33,000 and Philadelphia with about 28,000 people. This was quite an undertaking for a new nation. Yet, President George Washington and Secretary of State Thomas Jefferson felt the actual population number was greater than what was collected and reported. Think of the times, with poor roads, lack of good communication links and even just the unwillingness of people to provide such information to anyone – you can see why there was maybe an under-count. Interesting, three states had no slaves. They were Massachusetts, Maine and Vermont. In Vermont’s census reporting the 16 listed as ‘slaves’ were really free-colored. When doing research, always search for surnames (heads of Household), mostly males. The exception was if a female of the sole head of a household (not uncles, brothers, etc). Use for 1790 census the FamilySearch.org and Ancestry.com. 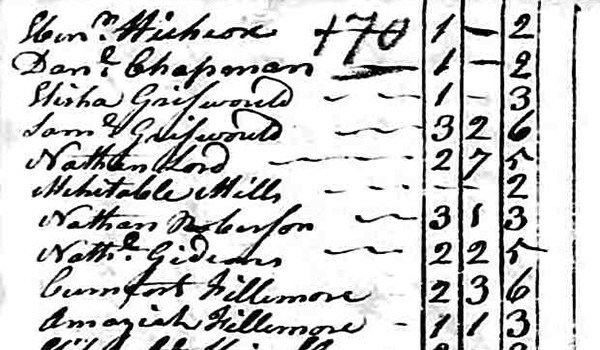 My 1790 ancestor – Conrad Sherman of York Co., PA had 3 white free males over age 16, 4 white free males under age 16, 3 white free females of all ages, zero non-white free persons and 3 slaves. Some other interesting facts related to that first census. Ben Franklin of PA was not in that count, he died April 17, 1790. The population represented about 4.5 people per square mile in 1790. To take the census cost the Federal government $44,000 (equal to about 3 million today). About 650 census takers were employed. There were 56 pages to the 1790 census report. The director of the 1790 census bureau was Thomas Jefferson. There were only six questions: Name of the head of the household, the number of Free White males of 16 years and older, number of Free White males under age 16, total number of free white females of any age, number of non-white free persons in household and the total number of slaves in the household. 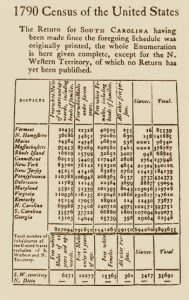 The 1790 census was done in all thirteen states including districts of Kentucky, Maine, and Vermont, and the Southwest Territory (Tennessee). Any existing census records for Delaware, Georgia, Kentucky, New Jersey, Tennessee, and Virginia are not available anymore, lost over the 1800s, especially in the fire of 1921. 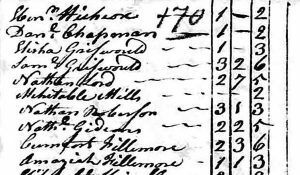 Photos: 1790 Census and census page with names of head of households.